We’ll Answer Your Termite Questions, Just Call Us! Termites and ants keep pest control companies in New Jersey busy throughout the year, but these pests certainly don’t work together. In fact, termites and ants have been enemies for ages. However, blind termites have been known to forage close to ant nests. How do they get away with it? Researchers have shed some light on how blind termites have been able to get close to ant nests without getting attacked. Scientists discovered that these pests are able to detect the tiniest vibrations ants make while moving. When they detect these vibrations, they have plenty of time to seek shelter from predatory ants. This fascinating finding could lead to changes in the way pest control professionals treat ant and termite infestations at some point in the future. For example, researchers could work on developing ways to mimic or produce the same acoustic signals that ants send out, which could keep termites far away from homes and other buildings. These research findings are important, but it will be a while before acoustics are used for pest control. In the meantime, pest control experts have other ways to eliminate termites. Having termites in your home means it’s crucial to get help from pest control companies in New Jersey. When you need effective termite control, you can rely on Allison Pest Control to be there. Our pest control experts can rid your home of termites and other pests. 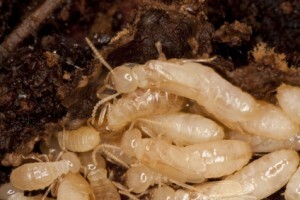 A Cluster of Termites Ready to Move Into Your Home! Termites are one of the main reasons that residents seek help from pest control companies in New Jersey. These pests do tremendous damage to homes in a relatively short amount of time thanks to their wood-destroying habits. As a homeowner, it’s important for you to know as much as possible about these pests. 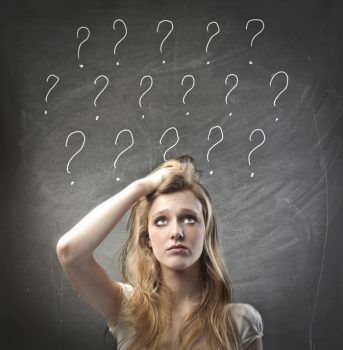 How do you know if you have termites in your home? You might see winged termites flying or swarming in spring. These termites are the ones that seek out a new site to form a new colony. Even if you don’t see the actual insects, you might see the wings they leave behind near window areas. Just keep in mind that flying ants also resemble winged termites, so you might need help from a pest control professional to figure out which pest you have. Other signs of termite trouble include damaged wood and mud tubes. When you see areas of damaged wood, this usually indicates that termites have been active in your home for several years. 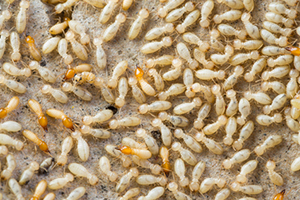 If you suspect that you have termites, a professional termite control company can confirm and then eradicate them. 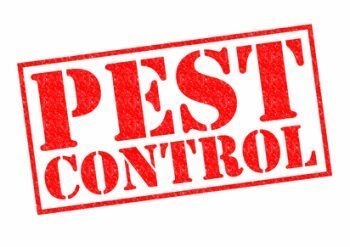 When it’s time to look into pest control companies in New Jersey, count on Allison Pest Control for help. Our pest control experts can handle termite infestations and problems with other common household pests in NJ. Termites are among the worst of pests, and they give pest control companies in New Jersey plenty to do. Although termites can wreak havoc on residential buildings, they exhibit some fascinating behaviors, as some researchers have recently discovered. Ants are the main predators that termites have to worry about. 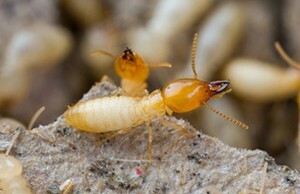 As a result, termites have learned to walk very softly in order to hide their presence from ants while foraging. Termites also have very sharp hearing, which makes it easy for them to hear the much louder footsteps of nearby ants. Researchers in Australia have also discovered that termites perform a head-banging behavior when ants are around. This is believed to be a way for termites to sound the alarm that these predators are nearby. When termites bang their heads, this sound mimics the sound of heavier ant footsteps. Termites might be good at hiding from ants, but they’re even better at staying hidden within homes. If you suspect you have termites, it’s crucial to have an inspection done. If termites are found, you’ll need to have them removed from home as quickly as possible before they cause extensive damage. When you have termites in your home, it’s time to start looking for a New Jersey pest control company. Contact Allison Pest Control, and we’ll provide you with safe and effective termite control for your home. Termites don’t need a lot of time to do a considerable amount of damage to your NJ home. If you have reason to believe that you have these pests in your home, it’s time to start looking into NJ termite control. There are different kinds of termite treatment options available. Being familiar with each kind can help you decide which is best for your home. Termite baits have the ability to destroy higher numbers of termites, since the poison in the baits is brought back to the nest. Placing termite baits involves putting stations in the ground around homes and monitoring them for termites. One of the drawbacks of this type of treatment is that it doesn’t protect homes directly. Repellent liquid termiticides are applied to the soil around homes near the foundation. These products usually last for up to five years. They’re also the most cost-effective option for termite treatments. Just keep in mind that repellent liquid termiticides don’t destroy termites. These treatments are considered among the most effective ways to kill termites. They’re applied to the soil around homes and are able to destroy foraging termites, which are the ones responsible for the most damage to homes. If you have termites in your home, Allison Pest Control is here to help. Contact us for more information on our NJ termite control services. Why Are Termite Infestations Discovered in March through May? When it comes to termites, homeowners have a lot of questions about these pesky pests such what do termites look like, how to know if they’ve invaded their home, what to do to remove the problem, and whether treatments are harmful to family and pets. 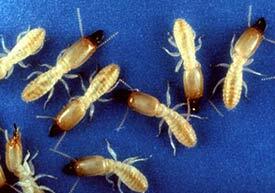 Termite infestations are most often discovered from March to May when you’ll see swarming winged termites. The bugs not only infest homes, they may also infest diseased or damaged trees and woody shrubs. Their primary food source is wood but they also chow down on books, paper and even insulation in the attic. When a NJ termite specialist inspects your home, some of the evidence being looked for includes signs of bugs around doors, windows, baseboards, woodpiles, foundation base, or wooden structures such as a patio. Mud tubes along walls are also an indication of an infestation. Termiticides are tested by manufacturer’s and evaluated by the U.S. Environmental Protection Agency and pose minimal hazardous effects on humans and pets. For peace of mind, if you have any health conditions or health concerns then it’s best to check with your medical doctor prior to the home being treated. For more information about termite infestations, treatment, and extermination, contact your NJ termite specialist at Allison Pest Control. In business since 1917, we’ve got the know-how to rid your home of termites quickly and efficiently.